Traditional clothes are a reflection of the people. When one thinks of Indonesia, the image of beautiful Balinese dancers dressed in fine blazing fabrics with golden headdresses and accessories usually comes to mind. However, few people know that Indonesia is divided into over thirty provinces each with a wide array of different traditional clothing. Most traditional Indonesian costumes belong to three cultures; Javanese, Sundanese and Balinese. For example, the kebaya and the batik cloth. As many other Southeast-Asian countries, Indonesian men and women traditionally wear a sarong, a long piece of cloth wrapped around the body from the waist down. The appropriate men’s attire for a wedding, a ceremony, an important meeting or any celebration, consists of a traditional sarong with a batik shirt. The patterns on those two pieces of clothes varies depending on the region. 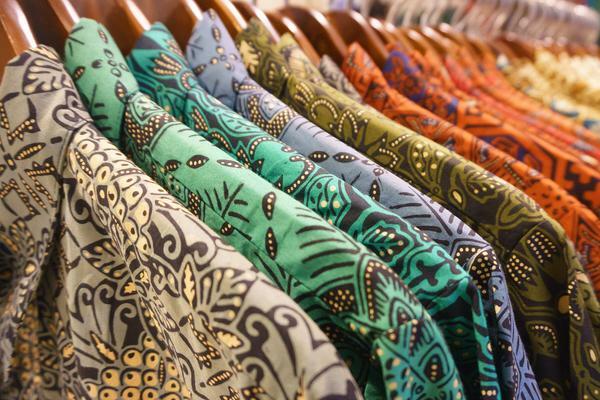 Batik is classified as Intangible Cultural Heritage by UNESCO. A number of political personalities including Sukarno, the first president of Indonesia, helped popularize the peci or songkok. This black cap worn by Muslim men, similar to the Turkish or Egyptian fez, has become the national headdress for formal occasions. The peci is an essential attribute to the presidential outfit and the government officials. The kebaya, traditionally worn by Javanese, Sundanese and Balinese women is now considered a national costume. This long sleeve blouse made of silk, cotton, semi-transparent nylon or brocade is worn with a batik sarong. The hair is normally tied into a bun and decorated with gold or silver hairpins but since a few years, many Muslim women choose to wear a Muslim veil, jilbab or hijab, instead of the traditional hair style. In the past, such apparels belonged to royal families and Indonesian aristocracy. Later, the wives of the Dutch colonizers adopted them. Nowadays, a kebaya with batik sarong are widely used throughout Indonesia for diverse kinds of events or celebrations. On formal occasions, the kebaya is to women what the peci is to men. Thus, the first lady of the republic is frequently seen attending official national or international events wearing a kebaya. The regional outfits called baju adat or baju daerah, represent the different ethnic groups. Hats and headdresses differ in each area. For example, the Udeng is the Balinese headscarf while the blangkon is typically Javanese. The motifs and the folding methods are different. Women’s headdresses are also specific to each area. The jamang is the crown worn by the Balinese and Javanese dancers. This splendid ornament comes from the Hindu Buddhist era. In Sumatra, the Minang bride wears a suntiang, which looks quite different from the Javanese jamang. There are various models of crowns throughout the country, some are especially for traditional dances, others for wedding ceremonies. Indonesian dancers like colourful and glittery costumes with golden ornaments. Just like the jamang takes us back to the Hindu-Buddhist era, the Ramayana ballet and its flamboyant costumes, will remind us of ancient kingdoms where the Indian saga was interpreted with dance and theatre. There are still many different models of traditional clothes. For example, the baju koko is a shirt worn by Muslim man on religious occasions. Like the batik shirt, it is worn with a sarong and a peci. In a certain community of Sumatra, women wear baju kurung, a Malay style tunic. In the south of Sulawesi island, the Bugis women have the traditional baju bodo with short sleeves. At home, Indonesian women like to wear loose and comfortable dresses called daster. In recent years, more and more Muslim women cover their hair and neck with a veil, jilbab or hijab. Today’s Indonesian dress code refers to the history of the country’s various cultural groups. If you take time to observe and research a little bit on the topic, you will discover the incredible diversity of traditional clothes and their influence on contemporary fashion. A number of Indonesian artists and prestigious designers create awesome collections inspired by traditional fabrics and costumes. Think of Tex Saverio or Biyan Wanaatmadja, who both repeatedly amazed the world of haute-couture with their modern yet, traditional creations. The museum Taman Mini Indonesia Indah in Jakarta has an entire section dedicated to traditional Indonesian costumes with an exhaustive collection representing each region and each ethnic group of the archipelago. 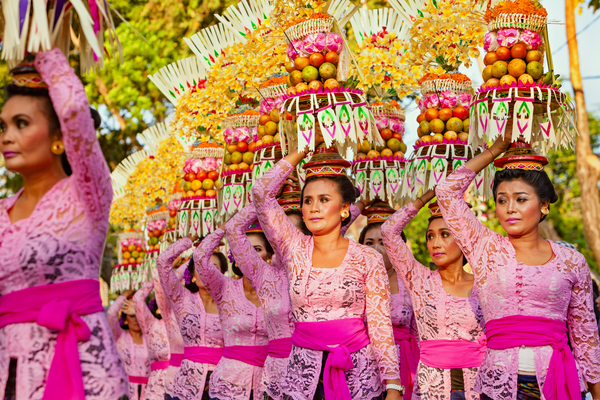 If you go to Bali, you might run into a Hindu ceremony or procession and see Balinese people wearing their best attire.